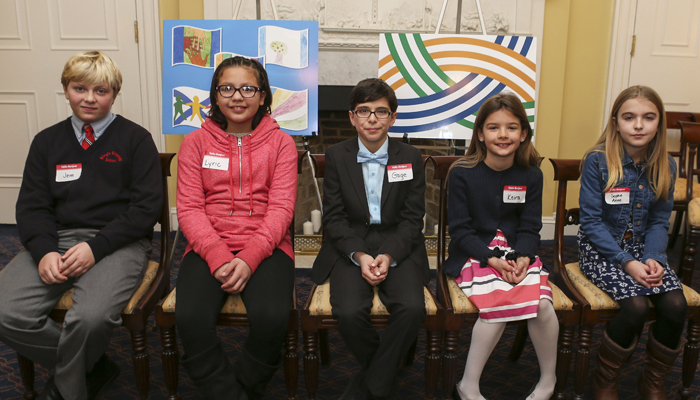 As part of the activities for the very first Heritage Day, which took place on February 16, 2015, Nova Scotian school-aged children and youth were invited to submit designs to inspire the creation of a Heritage Day Flag. In total, 240 drawings were received from 23 schools located across the province. Creative and colourful, each entry reflected the student-artist’s thoughts and feelings about Nova Scotia, and illustrated all the many different things that heritage can mean. The submissions were reviewed by a panel chosen by Arts Nova Scotia, and five top designs were selected. These illustrations were then shared with the professional graphic artists at Sperry Design, who used the artwork as inspiration for the flag. Sophie Anne Imlay, Boylston, Guysborough Co. In addition to attending the special unveiling, the students and their families were treated to a tour of Province House in recognition of their role in the flag's design. The colours in the flag reflect freshness, growth, landscape, water, and optimism. The interlocking design suggests bringing new meaning to old constructions, as in Mi'kmaw and African basket weaving, to create something different and new. The interlocking pattern suggests a strong, enduring fabric, diversity and the connections between our past, present and future.